As a friend whom we had afternoon coffee with remarked today, it's been raining for 24 hours straight over here, starting yesterday afternoon. Crazy right? Although, I must admit, I'm relishing the chance to cuddle up under a duvet in front of the television again - that's just something that's sorely missing from summer! I'm not a big sun-bunny (as is blatantly evident from my blindingly white legs), so I'm quite happy to embrace the wind and rain. That said though, sometimes you yearn for something to make you feel a little bit more summery on the inside, and I think I've found the solution for that. This dish with it's bright colours will definitely put a smile on your dial and it's a lovely fresh take on cabbage salads (is it just me who's not a big fan of the gloopy mayo-y versions?). Plus you get to feel all virtuous while wolfing down daintily nibbling on a big ole bowl of this. See, it's a win-win! Toss everything together and serve cold. Deeeee-lish! That, really is sunshine in a bowl....love the wolfing down bit!!!! Oh please, bring the sunshine! 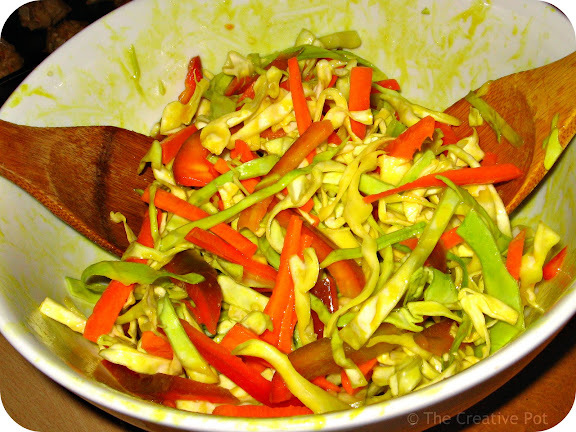 I love this salad and am a confirmed cabbage addict - cooked, raw, mayo or plain - you have me anyway!